The California Economic Summit has promoted a statewide conversation about how to increase upward mobility for the 18 million Californians who live in or near poverty, contributors have emphasized policy solutions that range from improving education, to increasing state and federal investment in the poor to more investment in workforce training. For Ann Ravel, a Californian who is a former Commissioner of the Federal Election Commission and chair of the California Fair Political Practices Commission part of the answer is a better and more inclusive electoral and government process. Whenever we open a newspaper or look on Twitter, we see how vulnerable we are to the undermining of our democratic institutions. Over the past twenty years, citizens in the United States have become more cynical about the value of democracy as a political system, less hopeful that anything they do might influence public policy and more willing to express support for authoritarian alternatives, according to a recent study by Harvard University. This is a reflection of the reality that people’s trust in government, at both the Federal and local level, and their distaste for government officials, has been steadily declining and is now at an all-time low. Just one in five Americans is willing to trust the government to do the right thing "most of the time." This loss of confidence extends to all formal institutions in addition to government, including organized religion, public schools, banks, organized labor, big business and the media, as measured by Gallup since 1973. Anger and polarization in our country has also seriously impacted our lives and our sense of community. It is not simply politicians, but the people themselves who are polarized, and growing even more so. An increasing proportion of Americans "dislike, even loathe" those who support a different party. Lack of trust extends not just to institutions but to other people. This polarization affects where we live, the news and information we consume and who we like on Facebook, all of which isolates us from others. There are many factors, including economic disparity and a sense that regular people do not have a voice in policy that affects their lives, which is contributing to this lack of trust and alienation from the larger community. It is vitally important to recognize that lack of trust exposes us to significant impacts not just on our democracy and government, but on our economy and our ability to make important steps forward in our state. Joseph Stiglitz, a Nobel Prize winning economist, notes that effective government requires shared action, but when there is no trust, people will have neither a sense of community or commitment to the community. The result, he concludes, is that people will not obey the law or adhere to contracts, since these acts require mutual trust. As Randolph Roth wrote in a perspective in the Washington Post after the mass shooting in Las Vegas, "When we lose faith in our government and political leaders, when we lack a sense of kinship with others, when we feel we can't get a fair shake, it affects the confidence with which we go about our lives." He concluded that loss of trust in government and a decline in the legitimacy of the justice system is the prelude to homicides and mass shootings. More blunt social scientists have put it this way: without trust in government, our nation will turn into "the Lord of the Flies." The change that we must make to remedy this situation is achievable on the state level. We have to strive for a more inclusive democracy and economy that reflects all of us, and we must invest in leadership and ways to encourage all people to find solutions to issues that they themselves care about. State and local governments and officials must be more transparent, and should truly believe in and encourage the agency of all people. This can be accomplished by redoubling efforts to involve those who have been uninvolved in the decisions affecting their lives. Establishing connections between people and their institutions needs to be a priority for all of us. A fundamental aspect of the Summit Roadmap to Shared Prosperity is to give people more self-control and to encourage greater civic engagement. 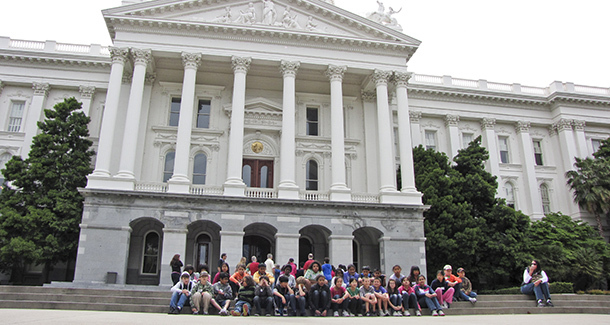 Dozens of Californians have opined in our Elevate CA series. To see what they've said so far, look here. The California Economic Summit will consider these opinions and others in developing a policy agenda to address this policy imperative in California. To register for the Summit, which will be held in San Diego on Nov 2-3, click here.